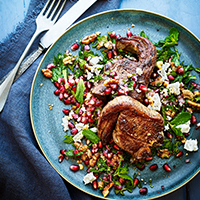 Simply cooked lamb with a jewelled dressing somehow conjures up summer even in the darkest days of winter. 1. Cut the pomegranate in half and hold one half, cut-side down, over a bowl. Using a wooden spoon, hit the outside until seeds start to fall into the bowl. When you’ve gathered all the seeds from one half, repeat with the other. Pick out any bits of pith. 2. Add the onion, vinegar and walnuts to the bowl. Stir in ¼ tsp ground cumin, the shredded mint leaves and 3 tbsp olive oil. Season, then put to one side to allow the flavours to mingle. 3. Rub the chops on all sides with 1 tbsp olive oil. Sprinkle with the remaining 1 tsp cumin; season. Heat a frying pan over a medium heat and add the chops so they are standing on their fat side, holding them upright with tongs if need be. Cook for 3-4 minutes, until the fat is crisp, then 2-3 minutes on each side. Remove from the pan and leave somewhere warm to rest for 5-6 minutes.